It seems that “the monster is out of the box” when speaking of Android PC solutions inside an USB stick. These chinese guys are replicating such idea while lowering its price on each iteraction. The results are appealing, yet again with the CX-01 Android PC. Before it, we had the MK-802 Android on PC solution, which was priced at 74 U$S per unit. The new CX-01 Android PC is tagged with the sensibly lower price of U$S 52! The CX-01 is powered by a Telechips TCC8923 processor, a CORTEX 5 class core running at 1Ghz. It includes 512mb of Ram and 4Gb of flash-ram to store your apps. On the connectivity side, it includes a mini hdmi video output capable of 1920 x 1080, a wifi b/g/n network interface, a USB 2.0 OTG (female connector … you can plug in there an USB keyboard, for example) and a microUSB connector. You can also use any 2.4Ghz wireless keyboard or mouse. The CX-01 Android PC comes pre-loaded with Android 4, including Android Market (now called Google Play) and Youtube client. It may be yet another way to have a working Android on PC, notebook, or even as a stand alone solution directly hooked into your TV. The CX-01 Android PC on a stick might prove a very tempting buy. It would be perfect if it had a MicroSD slot. It’s a very important lack. Hi Marc, you are right … it is an unhappy lack of vision. You stated the wrong processor model. It’s a TCC8925, not a TCC8923. Hi Bill … We do not have one of these CX-01 (yet) so we cannot confirm what you state. 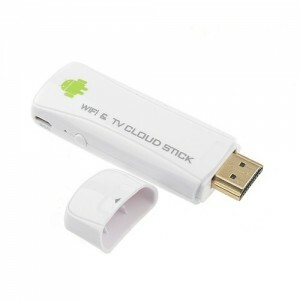 In our googling for cx-01 android mini PC, most sites commenting on this new usb Android PC state it includes a TCC8923. We are trying to get hold of one to check it for ourselves. Please, confirm us, if you own one or not, so we may be already on the sure side about the TCC8925. Is it possible to download and flash with the original firmware? Pandawill has firmware update and a quick search on google will bring root and patch for cx-01. Haven’t got mine yet- but interested if otg USB hub would boot USB flash. Mine Cx-01 is not working. Can you tell me how i can Restore it if its not working with TV?